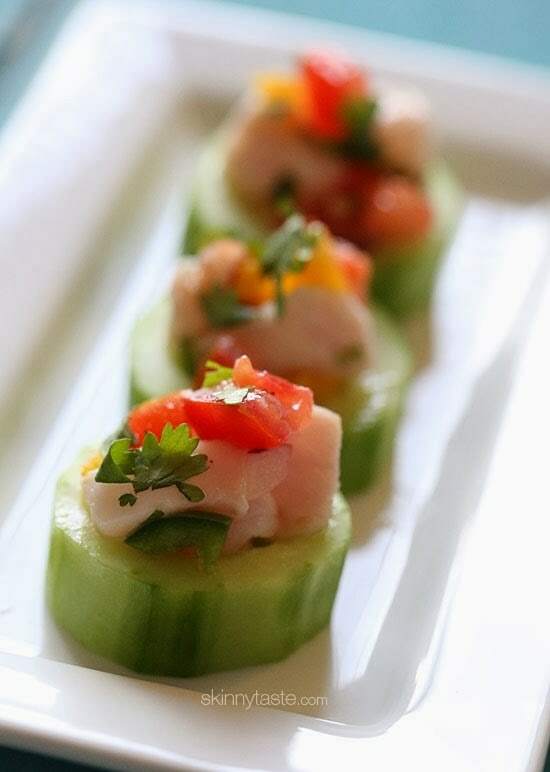 These Ceviche Cucumber Cups are made with fresh raw fish (shellfish), lime juice, onions and cilantro, making it gluten-free, paleo friendly and low-carb! A few weeks ago I went on a fun tour to one of the world’s best professional culinary colleges – the Culinary Institute of America in Hyde Park, NY. 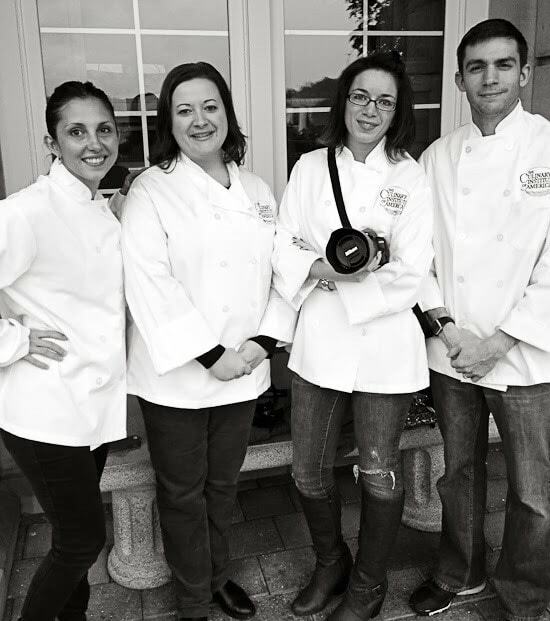 Pictured from left to right is me, Jennifer from Bake or Break, Kita from Pass the Sushi and Russ from The Domestic Man. I loved the tour and meeting new food bloggers – the group was small which was perfect to watch the classes in progress without interfering too much. Lucky for me, that day they happened to be making ceviche in their Americas cooking class and I got to eat it for lunch. I LOVE a good ceviche, and I order it any chance I get when I go out to eat, so I was excited that they shared this recipe with me. The good news – this is really easy to make and it looks so impressive if you’re having guests over. Their original recipe was made with scallops, but I opted for some fresh Striped Bass which I picked up at my local fish store. 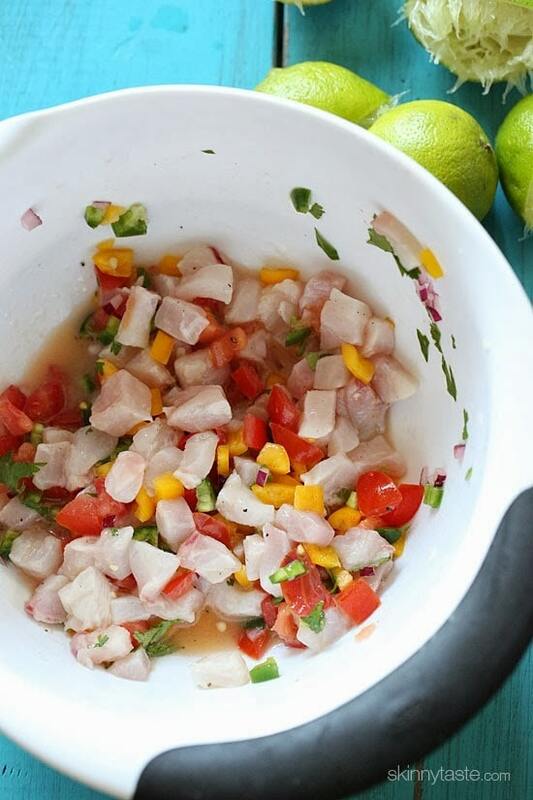 You can use any type of ocean fish or shellfish to make ceviche, the only rule of thumb is that it should be as fresh as possible, preferably caught the same day. This would make a wonderful appetizer for Christmas eve if your family likes to have fish. While you can prepare the cucumber cups and the vegetables for the ceviche a few hours ahead, ceviche tastes best when it marinates no more than an hour or two before you serve it. Funny where life takes you, I went to art school and studied graphic design at Pratt in Manhattan which led me to become a graphic designer/digital photo-retoucher prior to Skinnytaste. I believe those experiences helped me and my love of food photography, but if I was to go back to school now, I would LOVE to attend the CIA or at least take some classes their. 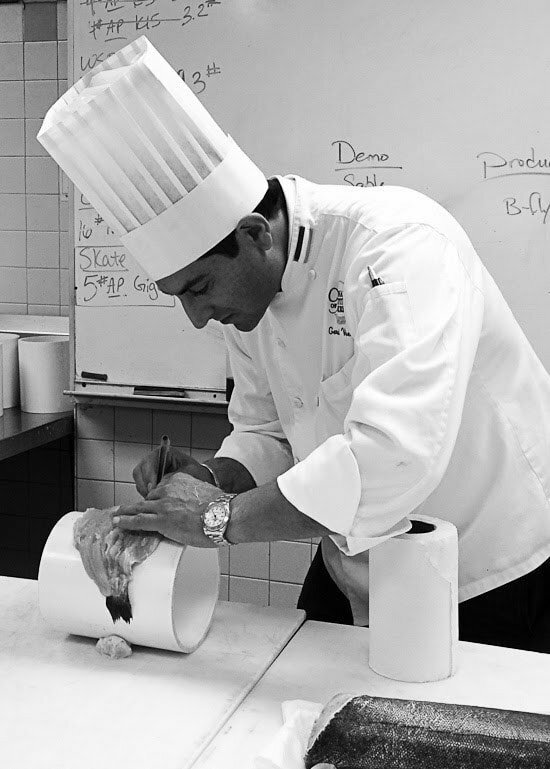 They are teaching our next generation of leaders – chefs such as Anthony Bourdain, Duff Goldman, Micheal Simon, Cat Cora, just to name a few are all CIA graduates. I mean, doesn’t this chef jacket and hat belong on me? 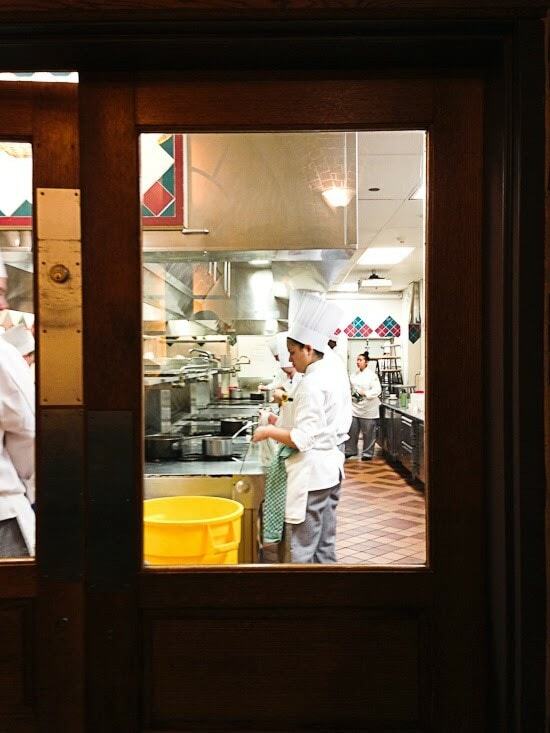 What’s really cool about the school is that all students work in 3-week course rotations, the senior class works at one of three CIA’s restaurants – both the front and back ends. So during our first night there we were served by the graduating students, with meals that the students prepared. We ate at the new French Bocuse Restaurant, and the food was phenominal. The highlight of my meal was watching the students make ice cream in 30 seconds with a hand cranked mixer and dry ice – amazing! If you’re ever in the Hudson Valley, you can go on a group tour and dine at one of their three award winning student-staffed restaurants. 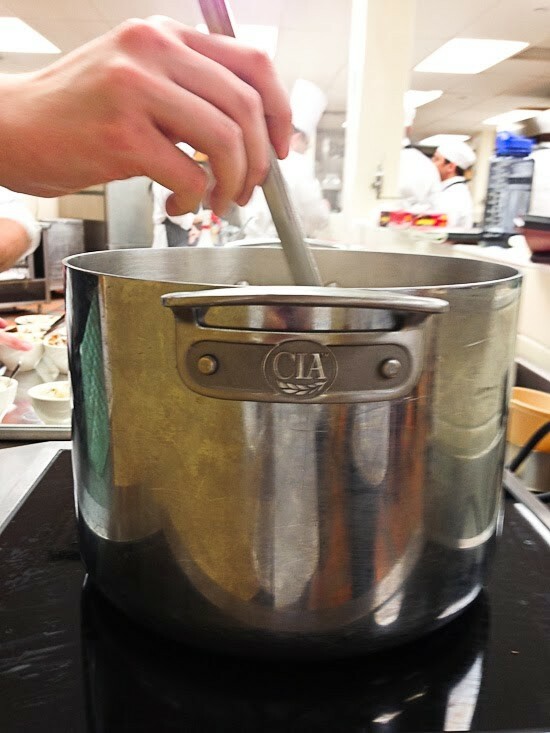 And if you’re thinking about pursuing a career in the the culinary arts, or have kids that are trying to decide their future, check out the CIA . 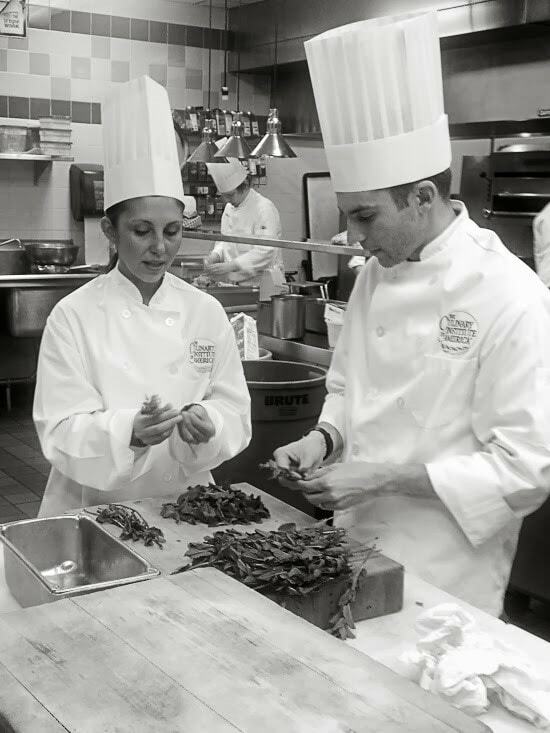 A 4 year degree is completed in 3 years, they have new classes starting every 3 weeks and offer classes in culinary arts, baking, nutrition, and culinary science. What’s more, they boast about their 99% job rate in leadership positions after graduating which is unheard of these days! Add the lime juice and toss to coat the fish. Cover and marinate in the refrigerator at least 1 hour depending on the size of the fish cubes, stirring occasionally. Look at the fish and you can see the flesh changing over time in the marinade, you are looking for a solid appearance in the flesh vs. an opaqueness all the way through the center of the fish. 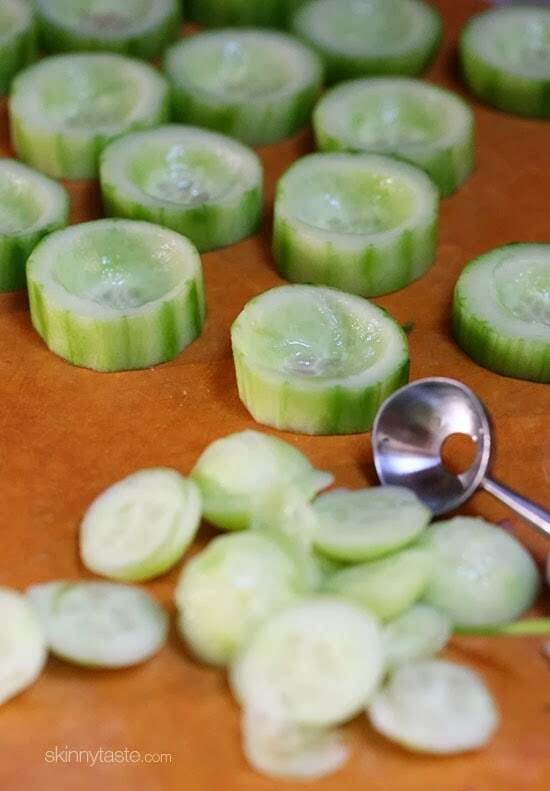 Trim the cucumber slices with a round cutter to remove the rind. 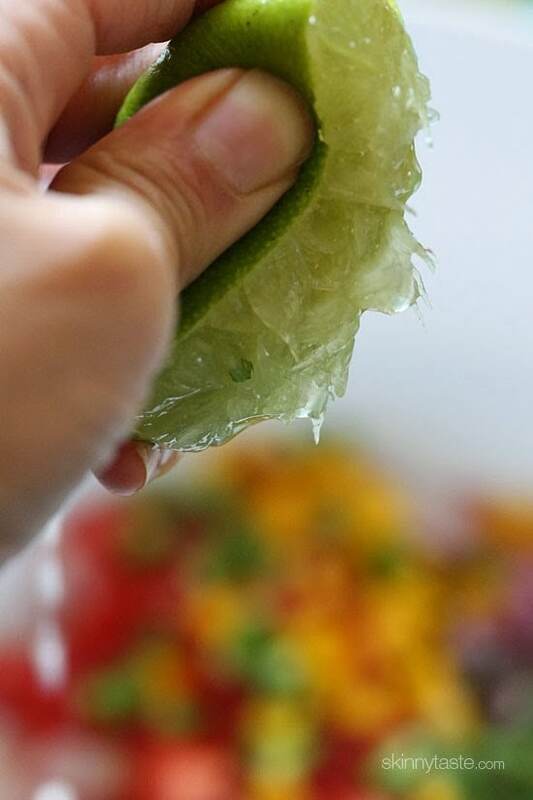 With a melon baller scoop out a shallow pocket in the middle of the cucumber slices—do not cut all the way through the slice. Just before serving, fill the cucumber cups with the ceviche. Garnish each ceviche cup with a small dot of sour cream and a cilantro leaf, if desired. Wow! This looks amazing! 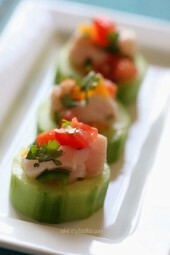 I would try making these ceviche cucumber cups​ for sure! Can I post it on my blog? I want to know what other kinds of fish I use in this recipe? Also, can I cook the fish before? My best advice is to ask your fish monger what’s freshest. I'm also interested. I'm in Michigan! Receta Gorgeous! Con sus ideas, siempre tengo algo para impresionar a sus amigos en la fiesta! ¡Gracias! I visited the CIA in Napa a couple of years ago and ate at their restaurant. It was a great experience. They had an option to purchase four or five (? I'm not sure I remember the number correctly) wines to pair with your meal. It's not a full glass of each, or you would get snockered, but it was definitely a wine valley experience that I enjoyed. I've always wondered how the cooking students handled tasting food that they didn't normally eat or even like such as some of the organ meats that you need to know how to cook. Did anyone address that? No, but I actually tried some while I was there. I guess I'm not afraid to try things. A heads up to anyone on the West Coast – there is a CIA outpost in Napa Valley at Greystone. I've eaten dinner there a few times and loved the experience. CIA was right up route 9 from me when I was in college. Unfortunately I never had a chance to visit 🙁 Thanks for the tour and all the great recipes you put out everyday! Oh I love ceviche. So fresh and light and makes you feel so healthy inside! PHENOMENAL!!!!! This falls into my diet COMPLETELY! I have so many dietary restrictions and this is GREAT! Thank you 🙂 Plus, your photos are beautiful! You just made my day with recipe!!! I can't get enough of ceviche!!! 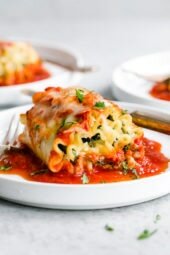 Gina, I religiously follow your blog and can't say enough about what your recipes have done for my passion of cooking & entertaining while maintaining a healthy, active lifestyle. I've made countless numbers of your recipes and have been told I could compete with my cooking abilities (little do they know you truly deserve the credit)! I also am a big fan of The Chew, weekday afternoons on ABC. If you are not familiar with the show, it's an afternoon talk show centered around food & entertainment hosted by Michael Symon, Clinton Kelly, Carla Hall, Mario Bitalli, and Daphne Oz. Right now they are holding a contest in conjunction with Weight Watchers to find the next Weight Watchers Chef. Every afternoon when I see the commercial, and every time I log onto eTools and see the ad, I can't help but think of how great a competition this would be for you and your abilities!! I'm not sure if you would be interested, but I know I would be a HUGE fan of seeing you compete! If so, more info can be found on both Weight Watchers and ABC's websites. You've got this in the bag!! Keep up all the great work on your blog, and I can't wait for more recipes, cookbooks and to see what's next from Skinnytaste! I don't think I got to try the ceviche! I may have to whip this up and give it a taste test ;D It was a blast meeting you. Back about nine years ago my husband and I went to Napa Valley to tour wineries for our anniversary. While we were there I got to walk around the CIA there. I gave me chills to walk in there and see it. I would love to go to school there. My husband still calls it Hogwarts because it is in a very old stone building! Of course I had to buy a souvenir from their store while I was there so I can always have a part of it here at home. Glad you had such a good time! This looks so good! Perfect for a Holiday party! 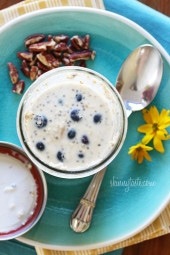 What a great recipe and post! Any suggestions for shellfish? Can I just use shrimp? Gina, I have someone who hates Peppers, is the something you can suggest that would still add a crunch/kick that would be missed from removing the peppers? The Yellow peppers that is, not the Jalapeños. You can leave them out honestly, next time I might leave them out. Great recipe! In 2006 I was downsized from my long-time corporate job and as part of my package I received some $$ for retraining. I put it toward a certificate program in culinary school. After that I worked both as a personal chef and in a restaurant, and while I'm no longer working with food (due to finances) it was an incredible experience for which I will always be grateful. I was already a good cook but the formal training was both very interesting and more challenging than I had imagined – but in a good way! I realize I am very fortunate to have crossed something off my "bucket list" that I never thought I would be able to do, and I still refer back to my curriculum, class notes and favorite recipes frequently. My advice to anyone who loves food & cooking is, if you can find a way to take even one class at a culinary school, go for it! I bet that was such a great experience. They do have food enthusiast cooking classes I plan to take myself. LOL, I am in the DC area, so when I read CIA in the title, I thought you meant the Central Intelligence Agency. I was thinking: "Hmm, that's strange, I am surprised they let her take a tour there." 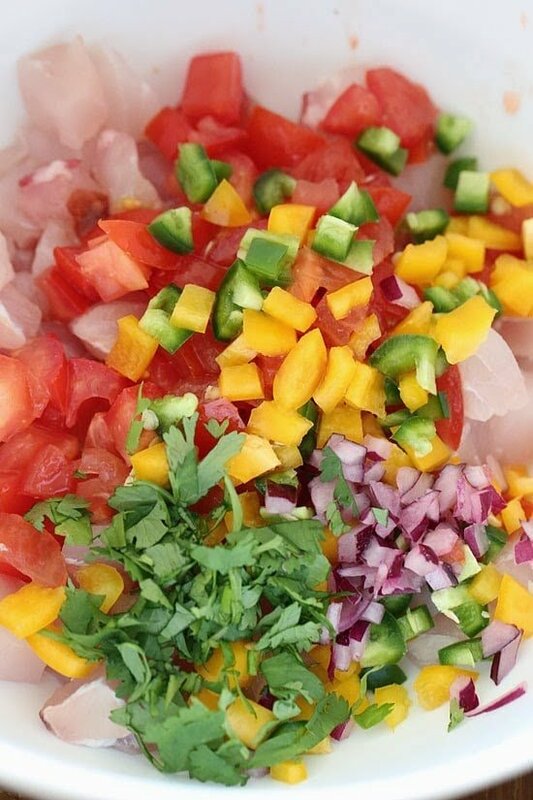 My kids love ceviche! What a fun experience! 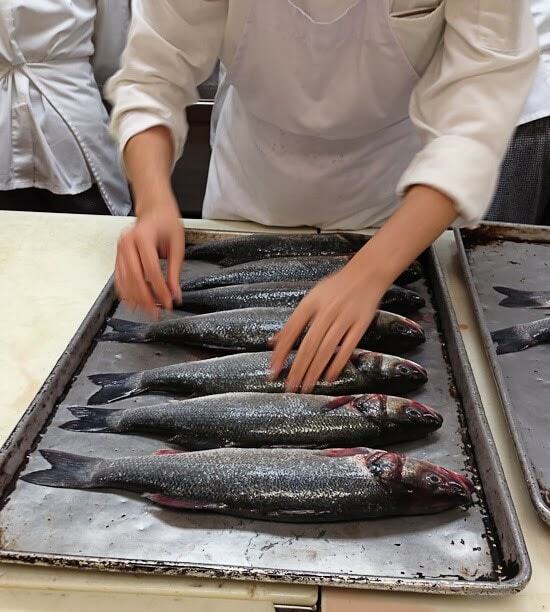 I was at the CIA Greystone this past summer participating in a cooking demonstration and it was so cool cooking in their kitchen – felt like I was on Chopped! 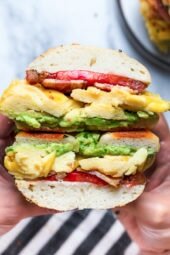 This looks amazing and I can't wait to make it! What a great experience for you to get to visit! Well deserved, due to you helping all of us over the years. Thanks for all you do! 🙂 I hope you get to take some classes because I'm sure that would be amazing!